Cambridge, MA. I recently wrote a remembrance of a very old swami, Swami Sarvagatananda of the Ramakrishna Vedanta Society. This time, I write of a middle-aged swami, who is by all accounts still very active in his ministry. The occasion is that recently I was sent a copy of The Journey Home: Autobiography of an American Swami, and asked if I could review it for a journal. I declined to do an academic review of the book since a) it would be difficult to describe and assess for an academic journal so vivid a first-person account, b) the scholar to do it would have to be expert in the era of spiritual journeys to the East and all kinds of details of religious places and practices in north India, as I am not; c) the book is documentary in a way, and one would also have to draw on the skills of an investigative reporter to report responsibly on what we read. But I trusted the person sending me the book, and I promised that instead I would call your attention to the book in this blog. It is certainly an interesting story, the spiritual journey of one Richard Slavin who, born in 1950 in Chicago in a Jewish family, goes on a pilgrimage through India when he is about 19 — one among many seekers who went to India in the 1960s and 1970s. His trip was most eventful and he had numerous adventures that are strikingly and entertainingly recounted in the book: large animals, unfriendly policemen, dubious and saintly teachers, exotic spiritual sites, robberies, mishaps on the road, friendships made and lost. Like many a spiritual autobiography, the external events and details turn out to be the setting for the author’s inner quest. His journey is a humbling, learning to be poor, a series of tests that push the author toward living by faith alone. Like any pilgrim, he does not see all of this along the way, but in retrospect sees how he was being quietly, insistently drawn toward God all the time. 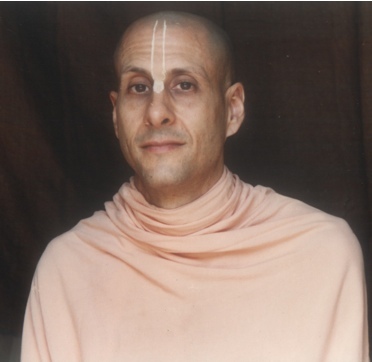 After and through it all, he discovers the spiritual path he has followed since, becoming a dedicated swami — an ascetic, teacher, and leader — thereafter to be known as Radhanath Swami. The photographs in the book make all this clear, reminding us of a series of gurus and swamis such as Swami Rama (founder of the Himalayan Institute of Yoga), J. Krishnamurti (wise man, teacher, writer), and Maharishi Mahesh Yogi (who guided the Beatles, among others). He is also pictured with Mother Teresa in one photo, and with the Dalai Lama in another. Radhanath seems deliberately — in the preface, on the cover — to be quiet about the fact that he is a swami in the International Society for Krishna Consciousness, the Hare Krishnas. Not that he hides the fact, since the climax of the book is after all his encounter with A. C. Bhaktivedanta Swami Prabhupada, charismatic founder of ISKCON. It is wise in a way not to make much of this connection on the cover, and instead to highlight the fact of this very human journey of spiritual discovery and grace. Readers might be distracted, too soon, by the overlay of an exotic tradition that remains ill-understood by most Americans. But to me, it is worth noting that ISKCON is by now a rich spiritual and theological tradition which, despite its difficulties and growing pains along the way, is maturing as a community true to its ancient Indian roots. Thus my decision to draw attention to the ISKCON connection in the title of this piece. Radhanath gives flesh and blood and spirit to ISKCON; this book is a good way to begin to understand what it means to be a Hare Krishna — willing to devote oneself to praise of God (Hare! Krishna!) who is present as Krishna, young, so very near in flesh and blood, loving as he is loved. I must confess too that the book enabled me to think back on my own spiritual journey; he and I are the same age, and by 18, right in New York City, I had ventured my own life-long commitment to God, a great gift I received. (Readers may recall that I wrote about this last fall.) In a way, we were both saved by a spiritual insight into the love of God that carried us through those tumultuous years, and kept us going until now. In other ways, our lives have obviously been very different: born a Catholic, I am a Catholic; I have never really been on a quest for God, who seems to have been there — here — from the start. I am a professor, and my many visits to India have been by comparison extremely low-key and uneventful; readers of my autobiography would have to put up with descriptions of bookstores, research centers, and pictures of me sitting first at a typewriter, now at my computer. There is much to be said about Christ and Krishna, of course. For centuries, books have been written on the topic, and Radhanath's book does not seek to resolve the theological questions that arise when two great monotheistic traditions meet (for I do think ISKCON is a monotheistic form of Hinduism). In such an encounter, however reverently and graciously engaged, those of us who are Catholic will still have tough questions to ask ourselves, about God's work outside the visible Church, in persons and in traditions. Reflective swamis too will want to ask about the meaning of God's work in the lives of faithful Christians. But it will help all of us to hear each other’s stories, how God was found, how God finds us when we are young and keeps after us for a lifetime. We should imagine a kind of dialogue — not of religions or theologies this time — but of women and men of different traditions who, upon reaching a certain age, tell their stories with a certain wisdom and humor and in that way speak to one another across religious boundaries. In particular, Radhanath’s account invites us baby-boomers — readers of this blog included — to look a little deeper into how we found, lost, kept, gave away, were given (back) the faith — how we managed to find the 1960s a time of grace and wonder. For this invitation, we can all be grateful to Swami Radhanath. But judge for yourself; take a look at the book, see what you think. If you study the Vaisnava tradition, particularly the Gaudiya Vaisnava tradition, it is unquestionably a montheistic perspective. The teachings of Caitanya Mahaprabhu and the Six Goswamis of Vrndavan establish this point from the texts of the Vedas, both sruti and smrti. Unless we understand and realize the absoluteness of GOD, we remain on the relative platform or bodily-concept and identifying oneself with a particular sect, caste, creed or faith. Once we accept and know about the Absolute Truth and our relationship with Him all the conflicts are automatically resolved. 'Bhakti, or devotional service, means engaging all our senses in the service of the Lord, the Supreme Personality of Godhead, the master of all the senses. When the spirit soul renders service unto the Supreme, there are two side effects. One is freed from all material designations, and one’s senses are purified simply by being employed in the service of the Lord.’ Quoted from Närada-pancarätra. So we have to become bereft of the bodily designations and the only suggested process during this Yuga is devotional service to the Supreme Personality of Godhead Sri Krsna. We require many more God-realized souls like HH Radhanath Maharaj to take the human civilization to this ultimate realization to bring peace and happines in this degraded times of quarrel and hypocrisy. Swami Radhanath's book is indeed fascinating, but what is most fascinating is how the Swami has "re-invented" his history in the 15 or so years since he stepped down as a top lieutenant to Swami Bhaktipada, the controversial excommunicated Hare Krishna leader of the New Vrindaban community. Those who knew Mr. Slavin / Radhanath around the time of the murder of Steve Bryant (Sulochan das) have a very different perspective of his spiritual commitment. A good book to offer a "counterpoint" of sorts is "Monkey on a Stick" (by Hubner and Gruson), which details some uncomfortable events in which Swami Radhanath participated as a top aide to Bhaktipada. Without meaning to disparage the fascinating details of Swami Radhanath's journey, the fact is that he has over the years "re-written" key details (now denying his harinam initiation by Swami Bon, for example) even of his India experiences, what to speak of his later experiences as a devotee in the USA. Readers should treat this book with the skepticism of a scholar, not the naivete of a devotee. To Tom Anderson: Sir, I am sure that if you were to publish your own autobiography detailing your life's struggles to find God, you include the most important events in your life that led you to that goal. If there were wrong turns or mistaken decisions, you might chose to leave those out if they were unimportant in conveying the gradual acquirement of that glorious objective. Radhanath Swami is a very rare soul in this world, whose life's journey is practically without equal in this modern age. The austerities he underwent in his one-pointed dedication to find the Lord, and to love the Lord, and the obvious reciprocation that the Lord gave him marks him as a most blessed soul. To try to cut down such a kind and pure man as this with some references to his unfortunate associations in New Vrindavana, is only an act of envy. You may call the devotees naive, whereas you claim to be a scholar. So be satisfied with your dry and critical scholarship which has missed the point of this book entirely-that Krishna is a most loving God and He has shown Himself to his most loving disciple. MMK makes a good point. Roman Catholicism might be said to be not "monotheistic," because it accepts a triune God. Most Catholics would say they are monotheistic, though, because the Holy Trinity is also one deity. In a similar way, Vaisnava sects which teach that Vishnu is in some meaningful sense different from His shakti (Lakshmi) might be seen as non-monotheistic, although such sects (especially the Hare Krishna Gaudiya Vaishnava tradition with its extensive theology of inconceivable simultaneous oneness and difference, as elaborated in the sandharbas of Jiva Goswami) go to great lengths explaining how Vishnu together with His potencies constitute one single, undifferentiated Godhead. This simultaneous oneness and difference, though inconceivable to the rational mind, can nevertheless be explained from many angles, and realized by practitioners. One analogy often used (although material examples are always inadequate) is that the sun, though meaningfully distinguished from its rays of energy, can in another sense be conceived as one entity comprising the entire expanse of its radiant power. The Absolute (nondual) nature of "brahman" or "spirit" is such that nothing can be entirely separate from God, due to His spiritual identity with all emanations from Him. Unlike material causes which are diminished in producing effects, the inexhaustable, spiritual nature of God (Krishna) enables Him to produce millions of spiritual and material worlds without Himself changing one iota. Thus, He is simultaneously transcendent and immanent, as explained in Bhagavad-Gita 9.4-5. This is the pinnacle of monotheistic theology and helps us better appreciate the mystery of the Christian Trinity. Father Clooney, I'm not sure whether there was an entry error when you referred to "when two great monotheistic religions meet." I was raised in a strict Hindu family (brahmins, at that) and while there are certainly nuances in what individual Hindus may believe, the religion is most certainly not monotheistic. Vaisnavism (worship of Vishnu or Krishna) is most certainly monotheistic. I am a Hare Krishna devotee, and it is infact monotheistic. Radhanath Swami is genuine and sincere priest and monk. I lived at New Vrindaban in my late teens and early twenties. I also had the oppurtunity to travel with him. My mother met him in Columbus and said, "Even though he isn't a Christian you can tell he sees to the soul inside of you." I have been an Eastern Orthodox Christian for nine years but I feel obliged to testify to the genuine decency and sincerity of his character. I read the book in four days with tears in my eyes... When reading the first few pages of the book it reminds me the classic "Autobiography of a Yogi" from Paramahamsa Yogananda. I think one should also take Mr. Tom Anderson, and his contribution to the comments, with the "skepticism of a scholar," and not with "naivete". Thank you so much Father Clooney. Usually, when you read a good book you won't stop reading it. For me was this time also a case, but something different happened this time. I didn't want to read to much, knowing that book is every time coming nearer to its end. I just wanted to keep it reading and hoping it will never come to an end. For me it was a great experience to read it. I am very thankful to Radhanath Swami for writing it. Other thing about him is also that he has at the moment many thousand of dedicated followers all over the world. Many of them are high educated persons and I can hardly believe they are all naive to follow him without knowing him good before accepting him as a leader. The tree you can know by his fruits.